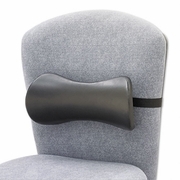 Memory foam back rest offers ultimate comfort and support. Updated style for additional comfort contours. Offers support along the spine, eliminating stress on pressure points and encouraging circulation. Smooth surface easily wipes clean. Adjustable strap holds cushion in place. Direct support to the small of the back. Offers support along the spine, eliminating stress on pressure points and encouraging circulation. Smooth surface easily wipes clean.